Are You Setting Up Your High School Student for College Success? College freshmen don't always go on to become college seniors. In fact, according to CollegeAtlas.org, 30% of students don't return after their freshman year. That's a startling statistic to grasp for any parent of a high school student. What's behind those numbers? How can a parent ensure their soon-to-be young adult won't be in that 30% who don't make it to sophomore year? One of the biggest challenges of parenting is figuring out when to hold on and when to let go. It starts really early — you wonder if you should pick up your baby when he’s fussing in his crib or see if he can settle himself down — and it never really ends. Of course, one of the scariest “letting go” moments is seeing that baby leave for college. And, because it’s so scary, there’s a strong temptation to control every part of the process that you can, from editing college essays to making sure your son or daughter keeps grades up in high school to have a chance at the best college. That said, it can also be problematic to wait until your child is kicking back in a dorm room to start giving up that oversight; too much of a sudden injection of freedom can be unhealthy for a college freshman who isn’t used to it. So, then, how to navigate that balance? To talk it through, we’ve imagined a hypothetical conversation between Pam, a concerned and caring parent of a high school senior, and Cathy, a friendly and helpful Executive Function coach. 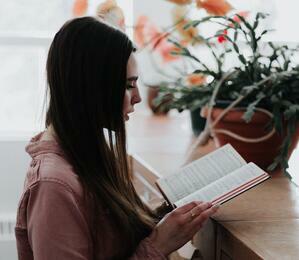 A while back, Cathy read two articles in the New York Times: How to Help a Teenager Be College-Ready, by Mark McConville, and When a College Student Comes Home to Stay, by William Stixrud and Ned Johnson. She finds the authors' insights valuable to share with parents who are preparing to send their kids off to college for the first time. Pam: Kyle is finishing up his junior year right now. I have to make sure that he stays right on top of his studies this year, so he can get good grades and develop good habits. Cathy: Yes, developing good habits is precisely the kind of thing Kyle should be doing during junior and senior years in preparation for college. How do you envision doing this? P: Let’s see. I should check up on his homework every night. I should make sure he doesn’t go out with friends on weeknights. I should talk to all of his teachers to make sure I know what he’s being assigned. And I should pull privileges if he starts to slip. C: I can see how all of those approaches will keep Kyle on track to get strong grades this year and next year. But what happens when he’s five states away at college? How will Kyle be able to keep track of his homework, resist tempting offers to hang with friends, and maintain a positive study routine when you’re not there to help with that? P: Well, won’t he see what I’ve done for him to help him succeed, and then apply those lessons? C: I wish that were true. But since 30% of freshmen don't return to college for their sophomore year, it indicates a decent number of students who may have had excellent support in high school are not utilizing the tools, strategies, and approaches that others implemented for them. P: Yes, but not my Kyle. He’d never be one of those 30% - he’s a good student! C: He definitely is! And a lot of that is because of you. P: Well, that’s alarming. OK, so maybe I should start doing some things differently. C: The good news is that you and Kyle have over a year together to work on building habits that he can take with him to college. The key is to remember that, according to the same article, “It takes time, practice and some failure to learn how to run a life. And you don’t want your child to learn these lessons in an environment that is as toxic as it is expensive.” So let’s start letting Kyle practice, and even perhaps experience some failure, in a non-toxic and less-expensive environment before he’s off on his own. P: Yeah, I see, he needs to start learning to stand without my support. But…what does that mean in practice, though? Should I stop checking to see if he’s done his homework? C: That's the idea. Stop checking his homework, stop withholding car keys until he studies, and stop emailing his teachers. Instead, try starting some new behaviors. You can try, for example, asking him what system he would like to use to manage the assignments he has to complete each week so he can begin to self-evaluate his choices. P: Ooh, that’s a good idea. I like the idea of making him think through developing his own systems. But…I’m worried. What if letting go means that he slips up, gets bad grades for a quarter, and can’t get into the colleges he wants to go to? C: He just might slip up. And I can imagine that will be hard on him and on you. It’s also going to be the best moment of growth for Kyle. You can ask him to reflect on what happened and to brainstorm ways to make adjustments for next time - and that way he’ll be able to right the ship well before the whole semester goes haywire. P: Okay, yeah, I can see how that can help him start to learn to handle his studies without leaning on me. What if he keeps slipping up this year and next, though? At some point I have to step in, right? C: There are probably some areas that Kyle needs more support with than others. You know him best. I think the key is to start helping Kyle make choices and reflect on those choices in some areas so that he begins learning how to self-manage before he’s doing that totally on his own in college. P: Thanks for your help, Cathy! I’ve definitely got a lot to think about. This sort of letting go isn’t easy. It’s difficult to watch your child struggle - or even risk struggling - when you know you could help them. But, as you know, that struggle is what helps them grow. Still, it can be a lot for both the parent and the child to navigate these tricky and tenuous steps to further freedom. In cases like that, it can be useful to have a knowledgeable intermediary who can help your child build independence-fostering skills. 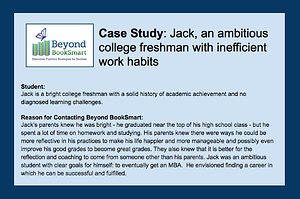 Find out how coaching helped Jack, a college freshman who struggled with time management and sustained attention. Download our Case Study below.